The beginning of the school year is a great time to lay the foundations for transforming your young learner classes into peer communities. As part of their development, children need to learn how to play and disagree with each other respectfully. Many of your young learners are still developing their social skills and for them to be successful in your class, it is important to show them how to build relationships with their peers. Getting to know you activities are fun and ensure we have a semester full of lasting memories. These relationship building activities help prevent bullying, provide opportunities for children to make new friends, and promote a culture of trust and scaffolding. Beyond these benefits, these activities get children to move, laugh, and step out of their comfort zones. Icebreakers and getting to know you activities personalize the learning. 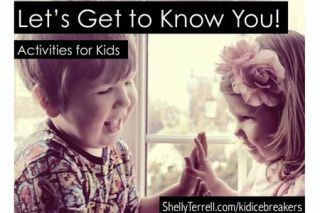 Below is a slideshow full of icebreakers geared for children! Keep scrolling to find descriptions and bookmarks! My Favorite- In my book Learning to Go: Students draw their favorite cartoon character (0r other category) on their tablets or paper. They lift up the drawing and run to a peer with a similar drawing. In my book, find the Knowledge Swap handout to go with this activity. Character Selfie Adventures- Pair students. Show them the Animal Selfies Tumblr or the Selfie Animal Tips video. They choose a favorite and write down reasons they liked this selfie. Then give each pair a stuffed animal, doll, character, or sock puppet. They will have to create 2 or more awesome selfies of this character. Toy Mingle- Each student is given a toy. Pair students. Give them 1 minute to play with each other before ringing the timer. Then they find another peer to play with for a minute. Exhibit of Me- Students create a diorama that is a gallery of objects and words representing who they are and what they like. About Me Posters- Students can use digital poster and scrapbook tools and apps to create interactive posters describing their favorites or talents. Try any of these tools: Buncee, Tackk, Biteslides, Smore, ThingLink, or Pic-Collage. About Me books, comics, or videos- Students can create books about their family, times they were brave, or what kind of superhero they can imagine being. Have students animate these stories with Bookcreator, Powtoons, Little Bird Tales, ToonDoo, or Makebeliefs Comix. About Me Word Clouds- Students use tools like Tagxedo or the Image Chef iOS/Android app to showcase their talents, likes, and experiences. Avatar Introductions- Students can introduce their digital avatars with Voki, BuddyPoke 3D Avatar Creator, or Tellagami. These are more free avatar creators! Name Poems- They create poems about themselves with digital poster tools like Buncee, Tackk, Biteslides, Smore, ThingLink, or Pic-Collage. Students sit in a circle and share their names. One student rolls a ball to another, says that peer’s name, and asks the peer a personal question. You could also have a ball with icebreaker questions on it that they roll to each other, touch and answer. Remember the matching memory card game where students have cards in rows, face down, then try flip each til they find it’s matching pair? They have to make 2 of every card that explains a favorite food, a pet owned, # of siblings, etc. They then pass their game to a partner to play. When the partner makes a match, the partner also has to guess what the matching pair represents about that student. The class gets into a circle & each student reports what they found out about their partners. Make sure that it is something that when the student teaches it, everyone else can also try to do it. For example, students can show the class how to make a paper airplane, free throw, origami frog, etc. If your students have low English skills, then you may want to have flashcards available so that they show you what their answers would be.